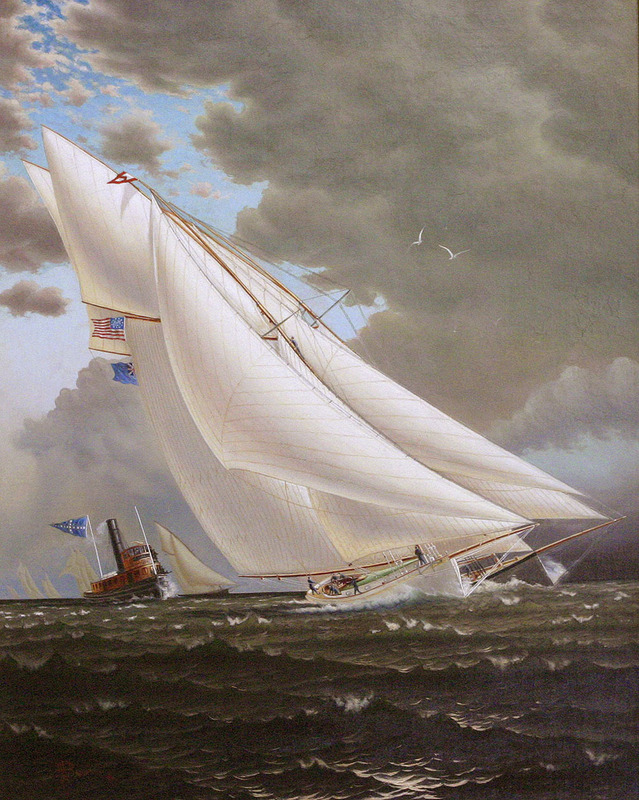 Matched in a challenge for the prestigious America's Cup, MISCHIEF of the Atlantic Yacht Club of Brooklyn, New York, and representing the New York Yacht Club, is featured in this epic painting and race. This America's Cup race was the first to feature two sloops in battle, with the Royal Canadian Yacht Club's representative, ATALANTA, running parallel immediately alongside the defender. Franklyn Bassford's portrayal is a quality capture of this important race. The scope of the drama, with the N.Y.Y.C. yacht squadron and others running in their wake and the spectators waving from the named tug boat, is further highlighted with the up-close action of the men on deck and one adventurous soul half way up MISCHIEF's mast. The Atlantic Yacht Club burgee is flown, with national ensigns in view. The tug flies a neutral pilot jack, but undoubtedly is loaded with American yacht racing fans. Under full sail, the yachts contest the outside Club course beyond the Narrows. Bassford, an elusive but popular artist in his time, has created a masterful work of the spirit and facts of the race. MISCHIEF, an iron sloop designed by A. Cary Smith, was an early �compromise� that borrowed some of the best features of English cutters and blended them with American speed. She handedly defeated ATALANTA, but was challenged in the contests by American Sloop GRACIE, that started 10 minutes behind the racers but came close to finishing first in both races on Nov. 9th & 10th, 1881.